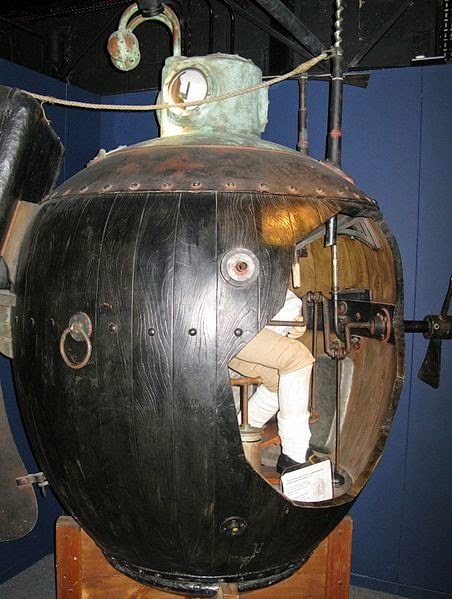 Today we find ourselves not so much all at sea, as all under a river, for on this day in 1776, Sergeant Ezra Lee made the first submersible attack in the American Turtle. His mission was to approach the HMS Eagle, attach explosives to her hull and then make good his daring escape! Needless to say, all did not go quite according to plan. The Turtle was built by David Bushnell in Old Saybrook, Connecticut, in 1775. 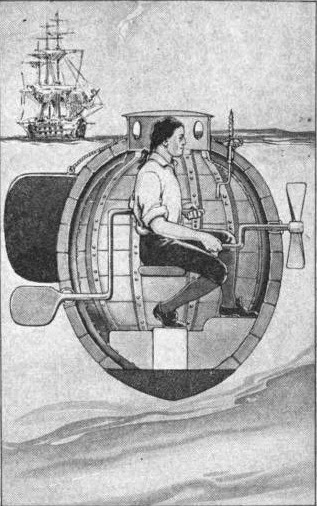 Buoyed by government funding and convinced that the Turtle was the answer to vanquishing the British permanently, Bushnell handed over the completed submersible following extensive tests and waited for his invention to play its part in the destruction of the flagship vessel. At eleven o'clock in the evening of 6th September, Lee took to the Hudson River in the Turtle, guided out by rowboats to start his journey until, finally, he began to pilot his craft towards the Eagle. In fact, the submersible barely moved at all until favourable currents caught it and propelled it towards the ship. Just as all seemed to be going to plan, Lee was faced with what would prove to be an insurmountable obstacle as, when he attempted to drill into the Eagle to attach the explosives, he had the misfortune to choose a spot directly atop the iron plates that protected the intricate rudder. Not to be deterred, he continued to try to drill into the ship for some time until exhaustion forced him to stop. A somewhat cursory attempt to go directly under the hull and drill again proved futile and the thoroughly beaten Sergeant decided that the time had come to call off the operation. As he fled at a couple of miles an hour, Lee set off the explosives anyway to distract British lookouts and the Eagle lived to sail another day. Although Lee reported that the charge set off an enormous explosion and columns of water rose from the river, the British reported nothing untoward and appear to have been utterly unaware of the failed assault on their fleet. The Turtle itself met a sticky end in October when the vessel that was carrying it was sunk at New Jersey. Submarine warfare would, of course, go on to be a major part of combat but for Lee, Bushnell and the Turtle, the underwater battle was over. Thank you for visiting; a fascinating subject and one that never ceases to inspire debate!